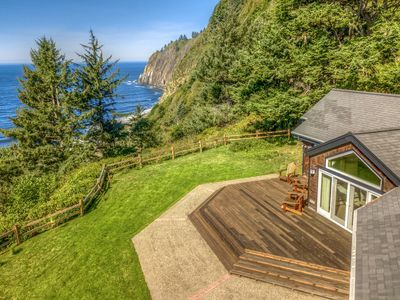 This oceanfront manor in Neahkahnie showcases exceptional ocean views and a serene, zen-like location for your next Oregon Coast retreat! Offering guests unbeatable views of the coastline, utter silence and absolute privacy, a gorgeous interior with a gourmet kitchen, and two master suites, Edgecliff will truly feel like your home away from home. 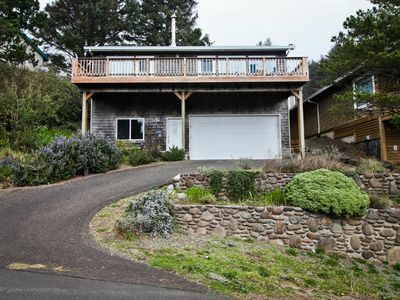 Nestled on a cliff just north of Manzanita, this house is in a quiet location far away from traffic and noise. 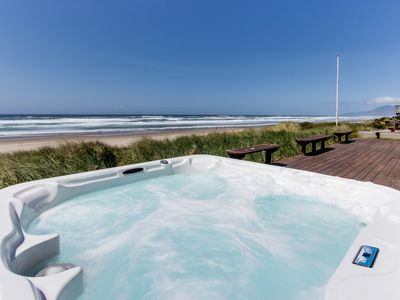 You'll be inspired by the breathtaking views of the coast and the sounds of the surf and birdsong. You can see the southern ocean monoliths at Tillamook Head all the way to the northwest base of Neahkahnie Mountain. 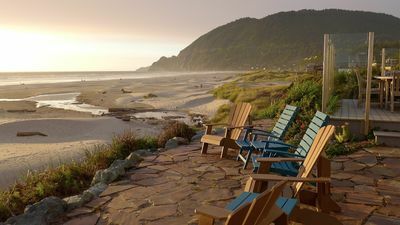 Manzanita is just a few minutes drive south, where you can grab a coffee, go window shopping, or grab a bite to eat at one of the many restaurants in town. 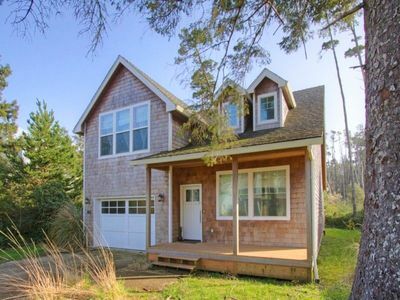 The quiet home offers a bright and open layout with high ceilings and picture windows, plus a unique split-level floorplan that will give everyone a quiet place to retreat to, whether you want space to work or create art, a window to gaze out of, or a cozy spot to take a quiet nap with the waves as a soundtrack. 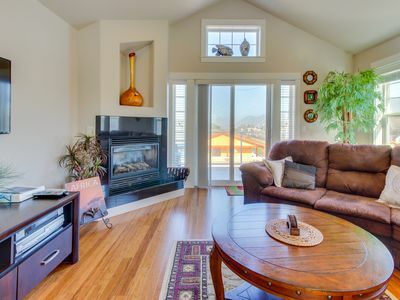 From the entryway, follow the hall to the right to find yourself in the open great room, with panoramic sea views, a sitting area, dining table, and gourmet kitchen. On stormy nights, get cozy by the wood-burning fireplace and watch the show through the windows - this is the Oregon Coast at its finest! The kitchen will make chefs feel right at home, offering double ovens, an extra large slow cooker, Breville mixer, espresso maker, coffee grinder, full assortment of utensils, and a dishwasher. The kitchen island adds more prep space and has an indoor Jenn-air grill embedded. The house is fully stocked with a variety of spices and teas. Adjacent to the kitchen is a utility room, with a commercial-grade washer and dryer plus a built-in iron and ironing board. The first master bedroom, on this lower level, has a king-size bed, sliding door to the deck, and a lovely bathroom with a cast iron soaking tub, where you can relax, enjoy the oceanfront views, and use the bath salts that are provided to soak away your cares while watching the sunset. Upstairs, there's a second master suite with a queen bed, en-suite bathroom, and doors that lead to a balcony with expansive ocean view. 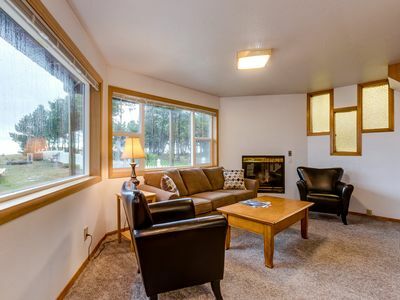 With two master bedrooms plus a convenient half-bath right off the entryway, this house is perfectly equipped to give everyone plenty of space and privacy. 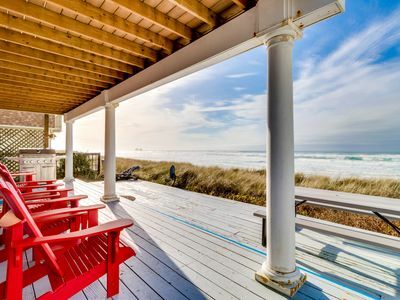 When you're ready to head to the beach, drive or walk about three-quarters of a mile south to an easy access point. 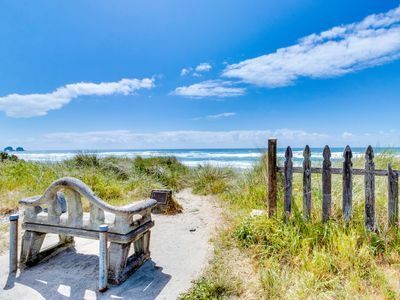 This stretch of beach north of Manzanita is very quiet, great for whale-watching and taking long walks. 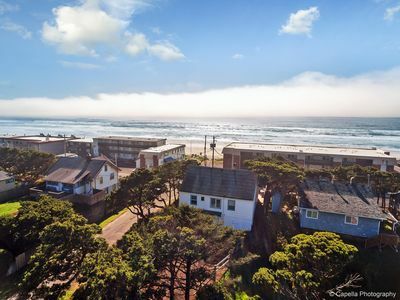 After you work up an appetite, head into central Manzanita for a bite to eat at one of the restaurants. Bread and Ocean is a favorite for coffee and baked items, and Neahkahnie Bistro is another mainstay. There are markets, souvenir shops, and plenty of other businesses to check out along Laneda Avenue. 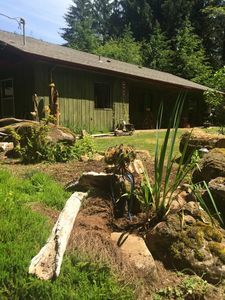 Manzanita is a charming town with plenty to offer, though you might also like to hop in the car and drive about 5 minutes to Wanda's Cafe in Nehalem or 8 minutes to Rising Star in Wheeler for a bite to eat. Edgecliff is ready to make your next vacation restful and memorable. 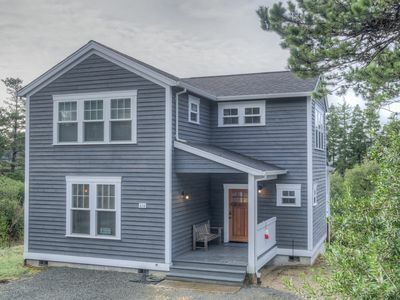 Come experience everything that makes this house so special! * Please note that this home is perched atop a cliff and children should be supervised to ensure safety - Edgecliff may be best suited for adults. Water Access: No Beach Access. You can drive/walk to beach. Beach is 0.7 mi away from home. 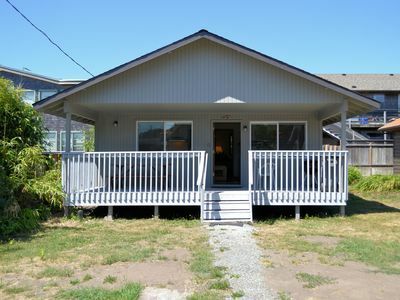 Modern home just few blocks to town and beach! 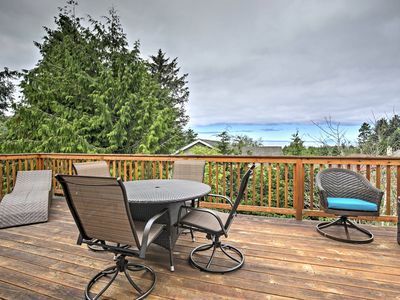 Two balconies, ocean & mountain views, steps from the beach! 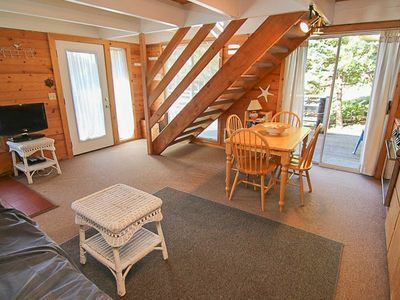 CABIN AT THE BEACH~MCA 1263~Adorable cabin only 1 block to beach and town. 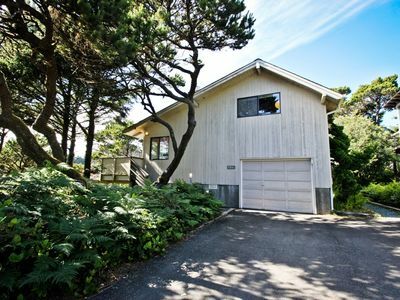 BELLA SOL~Great views of Beaver Pond, the ocean, and stunning sunsets! 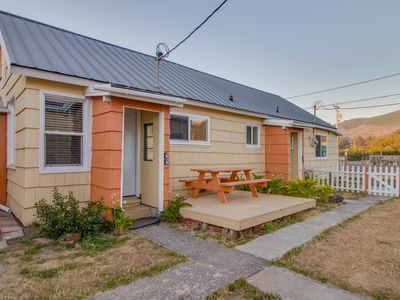 COASTAL COTTAGE~Adorable cottage just three blocks to the beach. 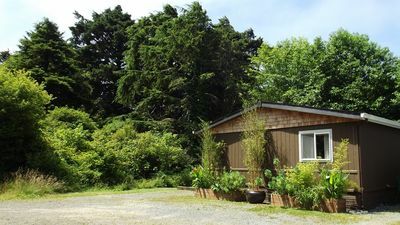 Seven separate cozy cottages - minutes to beach & downtown - dogs welcome! 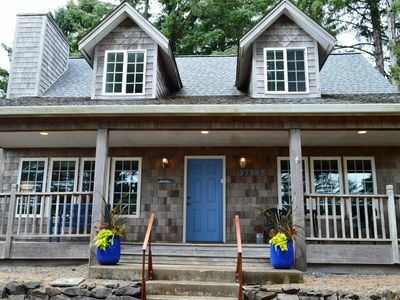 Sleeps 8 adults 4 kids, One Block to the beach!Perfect beautiful family getaway! 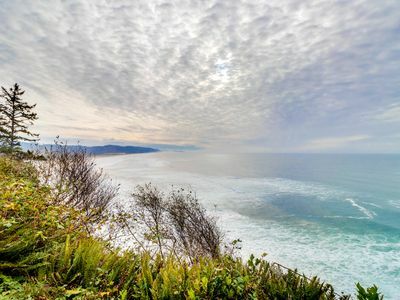 Oceanfront condo with balcony and amazing sunset views! 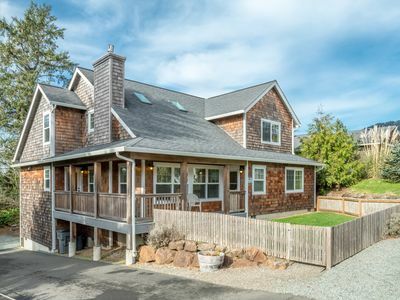 Make Happy Memories in this Charming Cottage in Manzanita!